The pirate princess is embarking on her journey across the seven seas to uncover mystical 5 reels of uk online slots and buried treasure. She’s looking for a trusty ship-hand to join her along the way and help her seize the bounty. 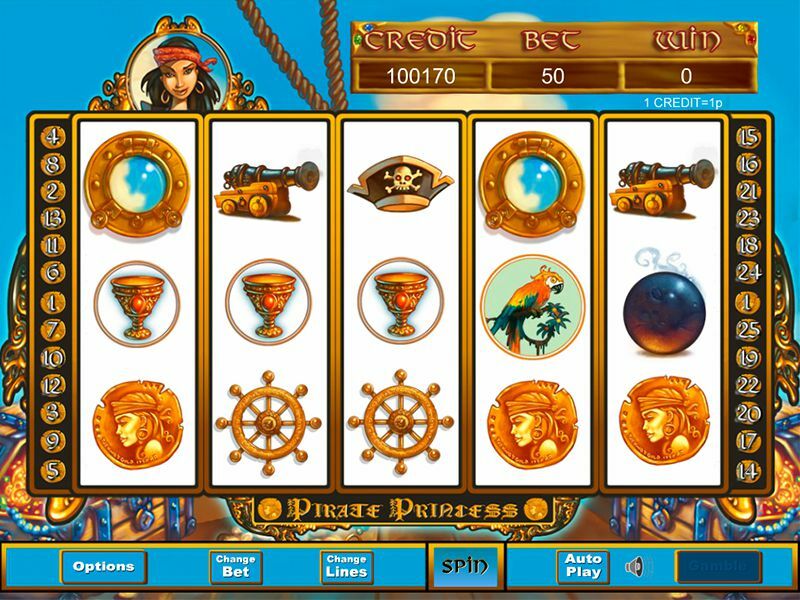 Meet Wild parrots after every spin and uncover exciting bonus rounds when you match three treasure map symbols in this online slot of piracy. Developer Eyecon has been running as a successful computer game company for over 20 years. Two years after it was founded their online casino took off and their first slot game was introduced in 2003. They are one of industry’s leading online slot game developers for bingo and casino based websites. Eyecon have produced over 60 high quality popular and timeless games available to players across many online gaming platforms. Each game is created to provide every player with a game they can enjoy for a long time and each year more players and playing unique games with Eyecon. You can find out more about Eyecon's exciting range of games here. All aboard the pirate ship as you sail the seas in a bid to find some treasure and battle against other ships with your cannonballs. 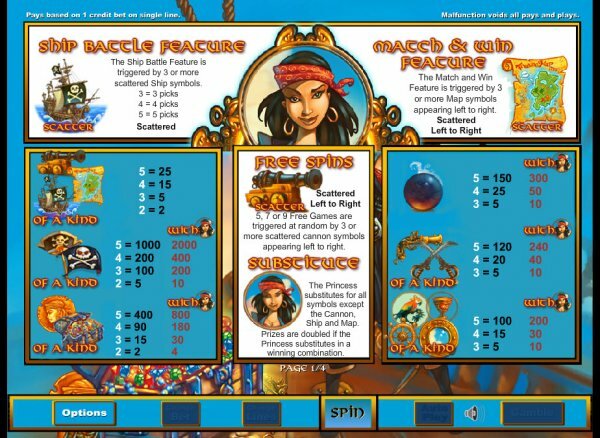 This 5-reel 25 payline games puts you in the heart of the sea with it’s pirate themed background and symbols including s Pirate ship, a map, a cannon, pirate hat, pirate flag, gold coins, treasure chest, a princess, a cannonball, a Blunderbuss gun, daggers, a parrot, a glass, a compass and a boat helm. All symbols are paid out from left to right apart from the scatter. You can choose the amount you wish to bet per spin ranging from 20p to £12.50 and you can select the amount of lines you wish to play from 1 to 25. We also often run various casino promotions with this game. The Princess symbol will act as a substitute for all other symbols apart from the Cannon, ship and the map, the prizes will be doubled when substituted with a winning combination of 3 or more scattered cannon symbols appear. This will then trigger 5, 7 or 9 free games at random. If a Cannon symbol appears during a free game and a ship symbols another on a separate reel on the same row as a cannon, the cannon will then fire and demolish all other ships in that row. Any ship that is demolished can be awarded up to 100x the triggering bet. Discover gambling slots online today! 3, 4 or 5 scattered ship symbols appearing anywhere will trigger the Ship battle feature this will give you the option to select 3, 4 or 5 cannon to fire, you will be rewarded up 100x worth the triggering bet. The match and win symbol can be triggered by 3, 4 or 5 scattered map symbols appearing from left to right, the number of triggering symbols will be multiplied by the triggering bet this will calculate the match credit amount. The gamble bonus round gives you the opportunity to win up to a grand total of 3,000,000 credits. See our slot games page for our full list of games, visit the site! 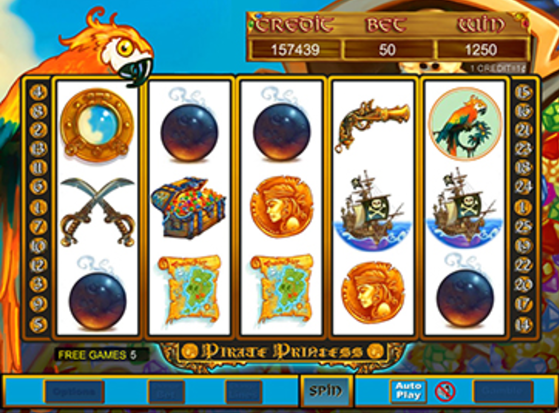 Pirate Princess offers all you can want from a lot game from amazing graphics to an enjoyable gaming experience. The range of features in the game are pretty cool and offer some great action up to 300x worth your stake. The setting represents the pirate theme well and is what makes the game that bit more interesting and addictive. The RTP for Pirate Princess is 95%.